Posted By PA Breast Cancer Coalition on April 15th, 2014 at 8:40 am | 215 comments. 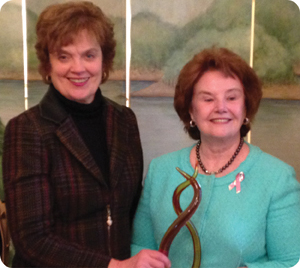 Governor Tom Corbett and First Lady Susan Corbett presented PA Breast Cancer Coalition President Pat Halpin-Murphy with the first-ever Hannah Penn Leadership Award for Civic and Volunteer Leadership during Women’s History Month. The award is named for William Penn’s wife, Hannah, who served as the first female governor of PA. Congratulations Pat! 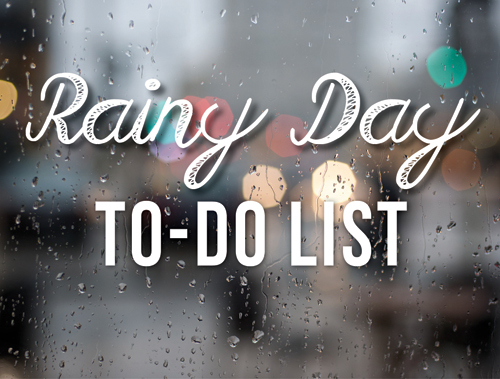 Posted By PA Breast Cancer Coalition on April 15th, 2014 at 8:33 am | 11847 comments. Every time I walk into the laboratory of a breast cancer researcher, I am inspired. Their passion to find a cure for this disease is what drives them every day. On this Tax Day, we hope that you will join us in taking action on their behalf through the PA Breast Cancer Coalition’s Refunds for Breast Cancer Research program. We hope you will join us and make the commitment to take action. Donate your state income tax refund on Line 32 to Refunds for Research and help us find a cure for breast cancer now… so our daughters won’t have to. This past week, the PBCC visited the Abramson Cancer Family Research Institute at the University of Pennsylvania to award Dr. Lewis Chodosh with a $50,000 grant for his excellent work studying breast cancer recurrence. With continued support, his discoveries may someday be able to prevent breast cancer from coming back years later. Learn more about Dr. Chodosh’s research on breast cancer recurrence in the video below. Posted By PA Breast Cancer Coalition on April 15th, 2014 at 8:33 am | 183 comments. The PBCC is heading back to three ballparks this Summer and you’re invited to join the fun! 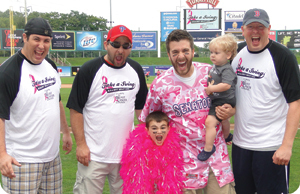 Go to bat against breast cancer with us in Harrisburg, Lancaster and Erie. We’re looking for batters and volunteers to fight for breast cancer survivors and their families. Can we count you in? Registration is now open for all three Take a Swing Against Breast Cancer home run derby events. This year, we’ve introduced three fundraising levels for batters with an easy-to-use website for receiving donations. Sign up as an individual batter or create a team and invite your family and friends. We hope to see you at this summer! Posted By PA Breast Cancer Coalition on April 15th, 2014 at 8:32 am | 1010 comments. Westmoreland County, home to one of the PBCC’s most successful Grassroots Partner events, Westmoreland Walks, Inc. will host our photo exhibit this May. The PBCC is also partnering with Excela Health and the Pa Department of Health to bring 67 Women, 67 Counties: Facing Breast Cancer in Pennsylvania to Greensburg. The exhibit begins with a FREE opening reception Thursday, May 1 at 6:30pm inside the North Entrance of the Excela Square at Norwin building. Join us to kick-off this inspirational exhibit and celebrate breast cancer survivors. Please RSVP to reserve your seat, as space is limited, by emailing Stacy@PABreastCancer.org or calling 800-377-8828 x 2306. If you can’t make it on May 1, the photo exhibit will be displayed through May 10 at Excela Square at Norwin. Many thanks to our partners Excela Health and Westmoreland Walks for bringing this educational exhibit to Westmoreland County! Posted By PA Breast Cancer Coalition on April 15th, 2014 at 8:32 am | 2388 comments. 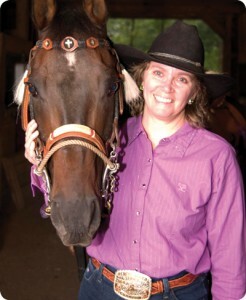 I was in the middle of Central PA Rodeo season in August 2004 when a routine mammogram found my breast cancer. My horse Reggie was winning a year-end award and I didn’t want to miss the chance to get the belt buckle prize because of surgery. Since my doctor is a horseman too he understood and I was able to delay the surgery until after the rodeo season was complete. Winning that series really helped me to move forward and face the breast cancer treatment. My mother also survived breast cancer twice and she opted for a mastectomy both times. That seemed like a better option for me too. I chose not to have reconstructive surgery. I didn’t want to go through additional surgeries and I don’t regret it for a moment. I wear a prosthetic and I’m comfortable with my personal choice. As part of my therapy after surgery, I brushed Reggie a lot. That was great arm-stretching exercise, and he was very sympathetic during my recovery. About five years later I decided it was time for me to give back to the breast cancer community. After a little research online I saw that the PBCC has opportunities for grassroots partners to create their own events and I thought that fit right in with what I wanted to do. I created a barrel race called Ride 4 Life. In rodeo, only women compete in barrel racing but in an open barrel race anyone can participate. Right now I’m planning the 4th annual Ride 4 Life show which will be at the Shale Knoll Arena in Annville on April 26th. A portion of each competitor’s entrance fee goes to the PBCC, and sponsorship funding is divided evenly between the show costs and donations to the PBCC. For more information: www.midatlanticspeedhorse.com. 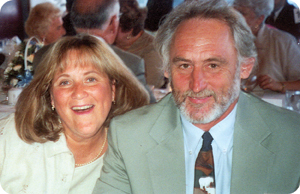 My husband Kenny was extremely supportive in every aspect of my journey and that really helped. My mom and my sister were very helpful right after my surgery and during chemo. People tell you you’re brave and strong when you’re going through breast cancer treatment but really you don’t think about that. You just grit your teeth and go. Posted By PA Breast Cancer Coalition on April 15th, 2014 at 8:32 am | 1650 comments. A new federal rule announced by the Department of Health and Human Services requires clinical laboratories to allow patients access to their own lab-test results upon request. Officials say this type of information can empower patients to track their health progress and make decisions with health-care providers. What does it mean for you? Some physician groups including the American Medical Association expressed concern regarding how patients would react to test results without a doctor’s explanation. The law gives labs 30 days to comply with a patient request so there is time for physicians to contact patients first. 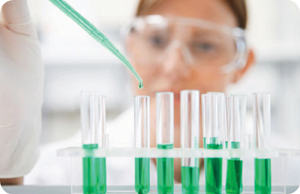 Studies show that nearly a quarter of all abnormal lab results are not communicated to patients in a timely manner. This may be an oversight from doctor’s offices, but patients may assume that their results are normal if they do not hear from their provider. This new ruling is a way to decrease this occurrence and allow patients another means of accessing their test results. The ruling does not mean that providers are no longer responsible for sharing test results with patients, it is a key that they share the results and communicate exactly what those results mean to patients and their health. To read the complete Wall Street Journal article published on the law, click here. Pregnant and Diagnosed with Breast Cancer? Help is Available. Posted By PA Breast Cancer Coalition on April 15th, 2014 at 8:32 am | 1323 comments. For some women, the happiest time in their lives is complicated by the scariest times in their lives when pregnant women are diagnosed with cancer. There is help available. Dr. Elyce Cardonick, a Maternal Fetal Medicine physician at Cooper University Health Care maintains a cancer and childbirth registry/data base of all pregnant women diagnosed with cancer and with each patient’s permission, reviews their cancer treatment and pregnancy outcomes. What is unique about this data base, The Cancer and Pregnancy Registry, is that the children are not only followed up until birth, but on an ongoing yearly basis. 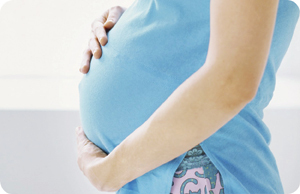 Pregnant women diagnosed with cancer find the registry helpful in learning how many other pregnant women were diagnosed and treated for the same cancer during pregnancy. Patient data is kept confidential. It is a valuable contribution to the oncological and obstetrical knowledge base for pregnant women with cancer. If you would be interested in contributing your information to the data base to advance the knowledge about cancer and pregnancy, please contact Dr. Cardonick directly. She can send you information and a consent form explaining the data base. Your health, and the health of your child, will be followed periodically. 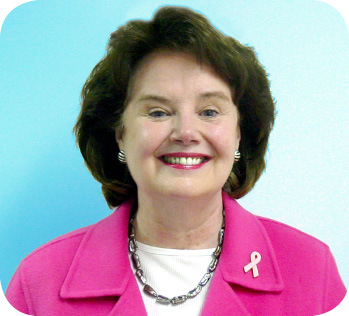 You may reach Dr. Cardonick and find out the details about participating in The Cancer and Pregnancy Registry at www.cancerandpregnancy.com or by calling her at 1-877-635-4499 (toll free) or at 1-856-342-2491. A message may also be left on her private voicemail at 1-856-757-7876.